A lovely, sufficient entertainment area is a must in most private gardens. This is your retreat after a hard working day. 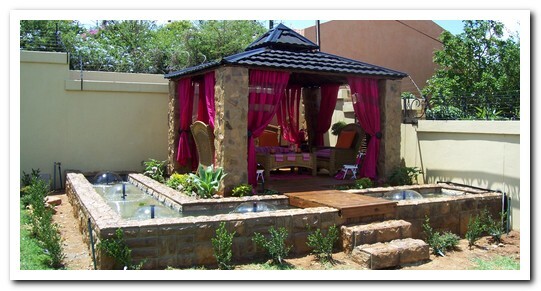 Here you can relax and enjoy the tranquility of your beautiful outdoor surroundings. It is also the place to come alive during weekends and holidays, entertaining your friends and family to a traditional braai after the rugby match etc. Eksklusiewe Landskappe design and create a whole range of entertainment areas such as the traditional thatch lapa as well as rustic African laths roofed entertainment areas combined with natural rock, beautiful sand stone, close formation and modular cladding of different colors, to enhance this important space of your home. Modern homes will be complimented with steel and glass structures to flow in union with the whole design. It is your choice to have the roof weather proofed or just as a shaded area.